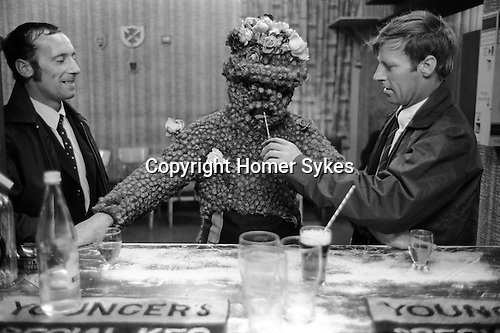 The Burry Man - John ( Jacko) Hart, South Queensferry Lothian Scotland. UK. With his helpers Billy Scott and David Scott in South Queensferry Ex Servicemans Club, taking a break from his perambulations of the towns boundaries. Second Friday in August 1971. John (Jacko) Hart was the local grave digger in 1971.